The arena will operate in three ‘modes.’ This will allow a variety of winter sports – hockey, figure skating, short track and curling – and summer sports – basketball, volleyball, futsal, kurash, boxing, fencing and taekwondo – to be played. Following the official ceremony, guests were treated to a display of sporting prowess by Uzbek athletes and a game of ice hockey between teams mixing veterans and young players representing the past and the future of the sport. 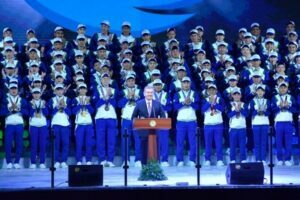 Well-known members of the Uzbek Paralympic team were also honoured for their courage and resilience in their performances for their country. In addition to being a state of the art sporting facility, the opening ceremony went a long way to show the multi functionality of the stadium in hosting other cultural events. Uzbek and Russian popstars – Philipp Kirkorov, Nikolay Baskov, Dima Bilan, the Yalla Group and many others – performed at the opening ceremony alongside a beautiful light show.